Garden Theme: Decorating a yard that is structurally and environmentally Tahoe friendly. Welcome to the McLeod’s garden – or should we say “work in progress”? We have been at our house for 12 years now and something is always changing. Original to the yard are the big pines, the lawn, the lilacs, some of the ornamental trees and lots of the front rock terracing. Everything else has arrived, departed or moved bit by bit. We try to feed the soil and not the plants, so we have put in hundreds of bags of manure and compost over the years. Almost all of the plants are perennial, so the summer bloom is very dependent on how the winter treated them. Our favorite plants include Tall Bearded Iris, Peonies, Echinacea and anything else tall and showy. Our goal is to have the structure of the garden beautifully planned and orderly but for the plants to be a wild riot of color, form and scent. If we get lucky, it happens... otherwise there's always next year. One interesting thing that we do is save all the debris raked from the beds in the Spring. We let it dry and then mow over it with the lawn mower to chop up the pieces. We use this material to mulch all of our pathways; in about a year it is like “duff”. We don't put it on the beds because of the high pine needle content. We send almost nothing off the property. The best moment of our day is usually a cruise around the yard. We are glad you're here and hope you enjoy it as well! 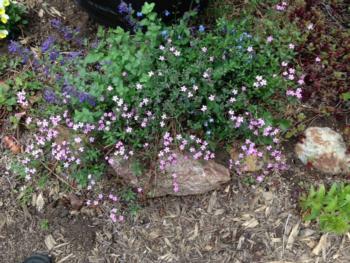 *Presentation at McLeod’s House: Fill your yard with perennials that reseed—how to make it happen in Tahoe.